Nothing to me as quite as simple and comforting as a peanut butter pie. 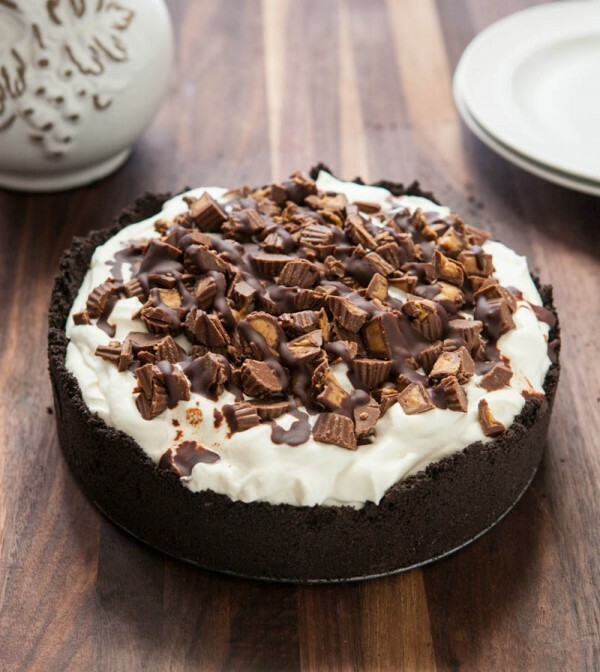 The combination of the chocolate crust, rich peanut butter center and fluffy whipped cream are just so amazing! My whole family loves them too, so they don’t last very long in our house. And did I mention this is a no-bake pie, score! 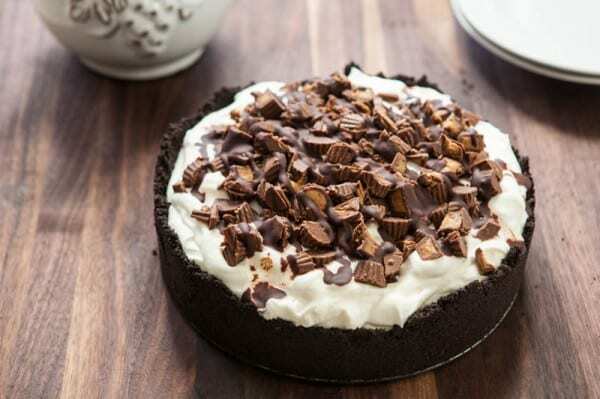 For this pie I wanted to add a little something special so I topped it with REESE’S® Peanut Butter Cups and a drizzle of chocolate. To start, I made the chocolate sandwich cookie crust just by crushing cookie in the food processor with melted butter and then pressing the crumbs into a spring form pan. Then I added the peanut butter layer and then the whipped cream layer. Then I just sprinkled on my peanut butter cups and drizzled some chocolate on the pie. That’s it, so easy! We love to make recipes like this and enjoy them while watching basketball. Basketball has always been something I’ve gravitated to I guess since I have always been the tall girl in class. Both my husband and I loved playing on our school’s basketball teams and still love playing horse in the backyard as well as watching real athletes play it for real. The REESE’S® brand and Walmart® are giving families some great ideas for making game day more special with the REESE’S® Baking Bracket Challenge™. I was so happy that I was invited yo help create this recipe as part of the 32 fun REESE’S® recipes that can be found at REESE’S® Baking Bracket Challenge. Fans who vote for my or other recipes (no kidding, they are all absolutely outstanding!) in a bracket-style contest will be entered for a chance to win a daily prize $100 Walmart® gift card! Game Day RecipesCollege basketball is a great opportunity to bring friends and family together for fun and making delicious Game Day Recipes. And, occasions like these are made perfect with REESE’S® products and affordable with Walmart’s® everyday low prices. Crush Oreo cookies in food processor. Pour in melted butter and combine cookies and butter until all crumbs are moistened. Press crumbs into an 8-inch spring form pan. Combine peanut butter, brown sugar, cream cheese and vanilla extract in a large bowl. 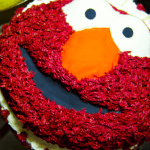 Use a hand held electric mixer to combine ingredients. After all ingredients are incorporated, pour into pie shell. Combine whipped cream, powdered sugar and vanilla extract in a large bowl. Use a hand held electric mixer to mix the cream until soft peaks form. Pour whipped cream layer on top of peanut butter layer. Top pie with roughly chopped Reese’s Mini Peanut Butter Cups. Combine chocolate and heavy cream in a bowl in the microwave or in a small saucepan. Heat on low heat until chocolate has melted. 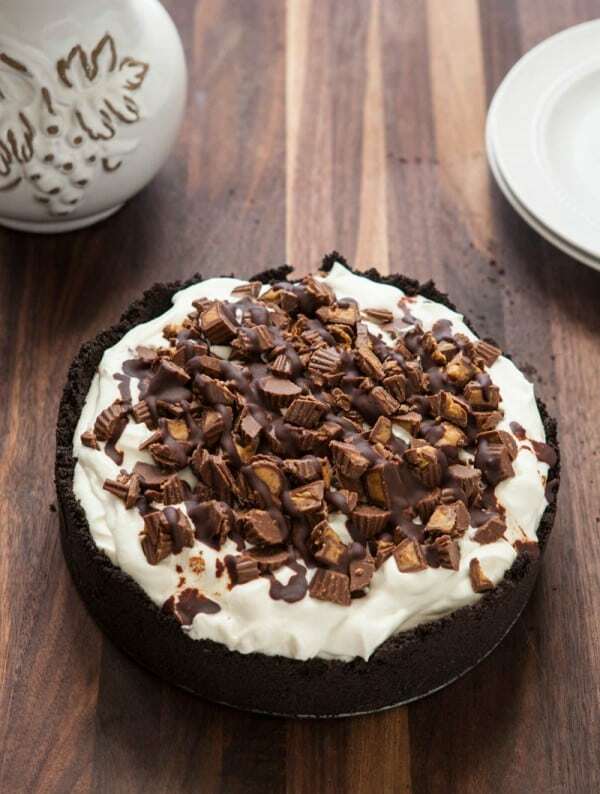 Drizzle chocolate over pie. Refrigerate until ready to serve. Ahhhhh, this looks so perfect! Pinning this one for sure!! What a dream for peanut butter loves. This is one gorgeous pie. Wow, this looks great! I don’t know if I should let my husband eat it, because he is trying to go on a bit of a diet, hehe, but I don’t know if I can resist making it! My word this looks incredible. I can’t be trusted near peanut butter and chocolate together! Peanut Butter Pie = One of our favorites! It looks lovely!! I could eat every bite of this! So delicious! I’m a big peanut butter fan and this pie looks heavenly delicious! Yummy!